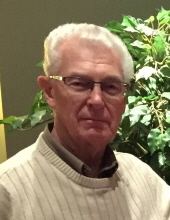 Charles Gary Steege, age 79, of Dresser, WI and formerly of Oshkosh, WI died Sunday, April 7, 2019, supported by family and friends at his home. Charles was preceded in death by his parents; brothers, Elden and Warren. He is survived by his loving wife of 58 years, Lois; daughters, Cheryl (Tim) Hunt and Lisa (Don) Ambli; son, Craig (Vicky) Steege; nine grandchildren and two great-grandchildren; also nieces and nephews. Charles was born November 18, 1939, in Clintonville, WI to Samuel and Lola (Riege) Steege. He was united in marriage to Lois Olson on May 6, 1961, in Clintonville. Charles raised his family in Oshkosh and retired after 30 years with Rockwell International. Retirement memories were built in Milltown, WI (Bone Lake) for 17 years before moving to Dresser. Charles was a member of East Balsam Baptist Church. He enjoyed fishing, farming, and time spent with family and friends. To send flowers or a remembrance gift to the family of Charles "Chuck" G. Steege, please visit our Tribute Store. "Email Address" would like to share the life celebration of Charles "Chuck" G. Steege. Click on the "link" to go to share a favorite memory or leave a condolence message for the family.